Today I found out there once was a MLB player who stole first from second. We’ve all seen the occasional child playing football accidentally run the wrong way on the field, and if you watch enough T-ball, you might even occasionally see a kid run the wrong way on the base paths. It turns out, there was once a Major League Baseball player who did this, only he did it on purpose. The man was Herman “Germany” Schaefer, who also had other nicknames given to him such as “Dutch” and “The Prince”. Schaefer was a notorious prankster in baseball who would do things like wear rain coats or carry a lantern out onto the field during the game, trying to hint to the umpire that they should call the game because of rain or darkness (more of his zany antics in the Bonus Facts below). So now we had men on second and third. Well, on the next pitch Schaefer yelled, ‘Let’s try it again!’ And with a blood-curdling shout he took off like a wild Indian back to first base, and dove in headfirst in a cloud of dust. He figured the catcher might throw to first — since he evidently wouldn’t throw to second — and then I would come home same as before. But nothing happened. Nothing at all. Everybody just stood there and watched Schaefer, with their mouths open, not knowing what the devil was going on. The umpires were just as confused as everybody else. However, it turned out that at that time there wasn’t any rule against a guy going from second back to first, if that’s the way he wanted to play baseball, so they had to let it stand. So there we were, back where we started, with Schaefer on first and me on third. And on the next pitch, darned if he didn’t let out another war whoop and take off again for second base. By this time the Cleveland catcher evidently had enough, because he finally threw to second to get Schaefer, and when he did I took off for home and both of us were safe. 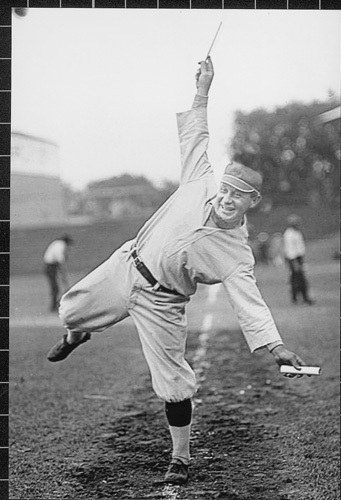 On August 4, 1911, Schaefer, playing for the Washington Senators, pulled the same stunt with less success, but at least this time documented in the newspapers. In this instance, it was the bottom of the ninth with a similar situation as above. There was a runner, Clyde Milan, on third who represented the winning run of the game (it was tied 0-0), and Schaefer on first. Schaefer broke for second and made it, but this failed to illicit a throw from White Sox catcher Fred Payne, as you might expect in the bottom of the ninth in a 0-0 tie where a runner on second is meaningless to the outcome of the game when there is already a runner on third. On the very next pitch Schaefer stole first, again without drawing a throw. This brought the skipper of the White Sox, Hugh Duffy, out to argue with the umpires about allowing Schaefer to do this. While Duffy was still arguing with umpire Tommy Connolly, Schaefer broke for second, this time getting caught in a run-down, at which point Milan tried to steal home, but was thrown out ending the inning. Not to be dissuaded, Schaefer argued with the umpire that this shouldn’t have counted because at the time of the play, the White Sox had ten team members on the field, though of course Hugh Duffy hadn’t played in a game since 1908. The umpires didn’t listen to his arguments and ruled that the play stood, as did his steal from second to first base because, at the time, there was no rule against it. The Senators went on to win the game 1-0 anyway. Besides using raincoats to try to get games called because of rain, Schaefer was also known to occasionally wear galoshes and sometimes to also bring an umbrella out, on at least one instance even up to bat as if he was going to use it to bat. One of the instances where he wore a raincoat got him ejected from the game. After his playing career was over, as a coach now, Schaefer would commonly walk the coach’s box painted line as if it was a tightrope during the game to further entertain the crowd and attempt to distract the other team. He also would occasionally use bats as if they were oars and act as if he was rowing across the grass. He also once was thrown out of a game in Chicago by Umpire Silk O’Loughlin (June 8, 1912) for eating popcorn in the coach’s box during the game. After hitting a home run out of Columbia Park in Philadelphia, Schaefer chose to carry his bat around the bases with him acting as if it was a gun and that he was shooting the pitcher Rube Waddell with it. This sort of thing wasn’t that rare for Schaefer, who liked to tell people he was psychic, and would often try to predict what was about to happen on the field. Most of the time, he was wrong, but, of course, as the late great Hall of Fame baseball announcer Dave Niehaus use to say “Nobody remembers those times, they only remember when you’re right”. A bit like when Mike Blowers called Matt Tuiasosopo’s first home run and the events around it in detail before the game even started between the Seattle Mariners and Toronto Blue Jays. 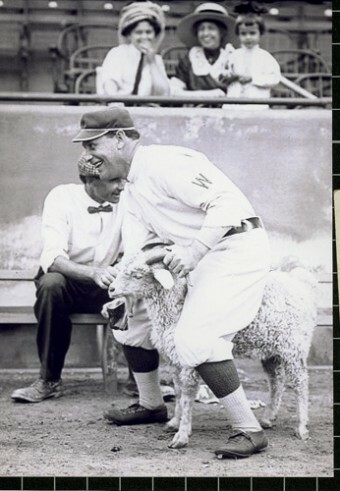 Off the field, Schaefer was just as much of a joker as on, including one instance that got him later ejected from a game. Umpire Jack Sheridan once fell asleep at his table at a bar, which happened to be next to a drainpipe. When Schaefer saw this, he went upstairs to the top of the drain pipe and, using a spooky voice, moaned “Jack Sheridan, your time has come…” into the pipe repeatedly until Sheridan woke up and heard, running out of the bar in fright. The next game Schaefer was in where Sheridan was calling balls and strikes, Schaefer stepped up to the plate and said in the same creepy tone, “Jack Sheridan, your time has come…” Sheridan promptly threw Schaefer out of the game. During one train trip, while on the vaudeville circuit with actress Grace Belmont in 1911, a fellow passenger in Schaefer’s compartment at night on the train yelled at Schaefer for keeping his lamp on while reading. Schaefer responded by turning off the lamp and then sneakily chucking what he thought were the passengers shoes out the window. In the morning, Schaefer realized he’d thrown his own shoes out. Schaefer’s pockmarked face was due to a smallpox epidemic that swept through Chicago when he was a boy. People who survived the ordeal tended to have badly pitted skin and Schaefer was no exception. Normally very jovial, this was one sore spot with Schaefer and he was known to become violent with people who made fun of his face, even with fans in the stadium where in semipro ball he frequently had to be pulled off such fans by teammates, according to a news account in 1898. In October of 1914, Schaefer randomly showed up in Court to defend some homeless drunkards who were to be charged that day. His principle argument was that “these poor souls should not be sentenced to 30 days in jail for an offense that a millionaire would be sent home in a cab for.” The judge sided with Schaefer and let the drunkards go. Schaefer then took them all out to dinner. 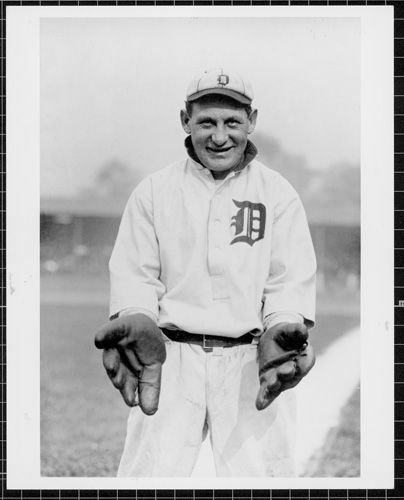 In a World Series game against the Cubs in 1907, while he was with the Tigers, Schaefer successfully pulled off the “hidden ball trick”, one of the few times this has been pulled in the post-season. 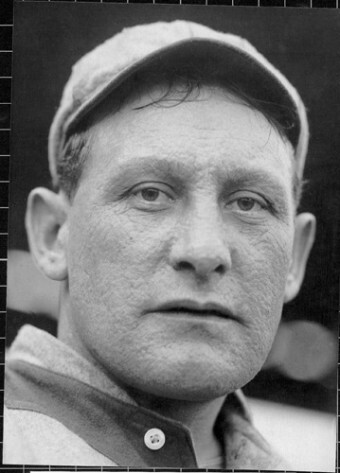 Schaefer gave Walter Johnson the nickname “Barney” after being pulled over in a traffic stop and talking his way out of it by claiming that Walter Johnson, who was in the car, was racecar driver Barney Oldfield. Schaefer got his nickname “Germany” from the fact that his parents were German immigrants to the United States. He got the nickname “The Prince” due to his outlandish, flashy performances on the field, often written as “The Clown Prince of Baseball”. Schaefer is said to have been the inspiration for the MGM musical, Take Me Out to the Ball Game, staring Gene Kelly and Frank Sinatra. “Segura led off the eighth inning with a single and stole second before Braun walked. Segura attempted to steal third, but Shawn Camp didn’t deliver a pitch. Instead, he threw to third well ahead of Segura, who turned and went back to second. “Braun was there, and shortstop Luis Valbuena tagged both runners as they stood on the bag. There is some question about Germany Schaeffer’s steal of first in 1908. I was rereading Ritter’s Glory of Their Times and read Davy Jones’ account of the incident. I then read on Wikipedia that questioned Davy’s memory of the incident. Well, I thought I would do a little research. I did find an article in the old Brooklyn Daily Eagle. It was on page 26 of the February 9, 1947 edition of the paper. The headline, as written by Harold Burr, was “Here’s a Guy Who Once Stole First”. The story goes on to tell the story much like Davy Jones had it. The person recalling the play was the one and only Georgia Peach. He placed the location and time as being played at Cleveland some time before World War I.